This cake is a win win. Healthy AND delicious! I could eat the frosting by the spoonful haha. I made some mistakes when attempting to make this cake, as it was a total experiment. Because of the mistakes though it ended up being even more delicious and unique (i love how there are whole raisins, sunflowers and dates mixed in...yum. and I like the texture of the frosting and cake)! I sometimes sweeten desserts a little more when I make them for other people. In my experience I have found that my taste buds have adjusted to a lower level of sweetness. On this blog I have been experimenting with healthy whole foods to create yummy dishes. 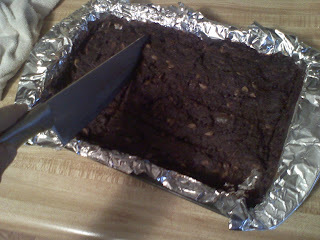 This cake is one of the results of experimentation...kinda like a chocolate fruitcake. A BRIDGE between healthy and sweet. A yummy bridge, that will surprise you when you see the ingredients. Have your cake and eat it too! Rinse off quinoa, boil in 1 cup of purified water and turn down heat to low. Allow to soak up extra water. This should take about 20 minutes. Otherwise, just follow instructions on individual box :) I had never made quinoa before (my sister always did that part lol) and it was really easy. While you are making the quinoa do not snack on the enticing ingredients you are to assemble. lol i did this ;) Instead use your time more wisely by getting a long rectangle pan out and putting non stick baking paper along the edges inside, or anything that will allow the cake not to stick such as this fancy foil such as the one I used. Remember how I said I made some mistakes? 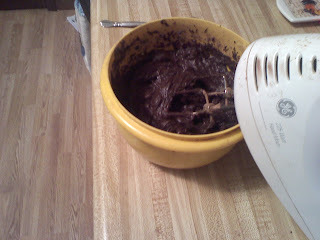 Well, the biggest mistake I made was to start making the cake and not checking first to see if my mom had a blender. Nope. No blender. Just a hand mixer. So how to blend the ingredients? 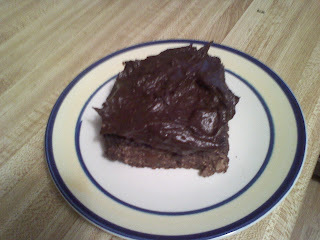 I am used to making raw vegan cakes and a vita mix blender is usually all you need. I don't think I have used a hand mixer since I was maybe five or six. I was wondering, do these things ninja chop or just stir? I gave it a whirl and was disappointed at first, realizing that nothing was chopped up. I was thinking well I can either throw in the towel and give up or I can just pour the cake batter into the pan with whole sunflower seeds, dates and raisins. What the heck why not? But first I added quinoa to the large mixing bowl and the cake batter was nice and dense. I spooned in the cake batter into the rectangle pan with non stick foil (or non stick baking paper). making sure to evenly spread out the mixture the best that I could. Bake at 350 degrees for one hour until the middle is soft and still a little moist. I had to keep checking mine. I stirred it all up occasionally too because I noticed the sides and top were getting hotter and baking faster than the middle. I am not an expert at baking so I figured it was best to stir it up so nothing would burn. FROSTING!!!!! Time to make some delicious frosting that you are going to want to make some extra so you can freeze it so you have some extra to snack on when it is a commercial break or movie night. Hey, it is a healthy treat right? Blend or hand mix until a creamy and light texture. Put frosting in fridge or freezer to keep cool. Allow cake to cool in fridge without putting the frosting on. Once cake has cooled you can put the frosting on. These measurements are flexible (according to your taste). You may like more or less sweetness, etc. I had lots of left over frosting. It keeps great in the freezer! you don't even need to thaw it. I am keeping my cake in the freezer and letting it thaw for a bit before eating.